Its always three things. As Mike suggests, even if you have 47 things to share, break things down into three major points. Some people can keep track of a bunch of things, but keeping organized so that there are only three things keeps you (and your audience) focused. They have to hear things three times. Why do you think your high school or college speech teacher told you when planning a speech, “Tell them what you are going to tell them. Tell them. Then tell them what you told them.”? People need some repetition to understand and process your message. After three emails, go have a conversation. If you have to keep going back and forth, there is probably something that can be handled much more deftly if you talked to one another than continue to waste a bunch of time typing emails. Relying solely on email just slows things down and invites misunderstanding. Yes, Mike really kept it to three things. You can be a stooge, or you can adopt these simple rules to help you improve your communication with others. “Dren” is right when she comments that people don’t really want to think about failure, but inevitably any plan will have some little failures in it. She points out that lots of people are starting to talk about failure in blogs and on the conference circuit. Failure is actually good, and our friend, if we learn from it. If we understand that we are likely to fail at first, it won’t bother us to do so–it is part of the process of learning. Setbacks are part of achievement. While we should expect we will face setbacks, we should not use this as an excuse to inadequately plan. We should be looking at our plans and asking questions, challenging our assumptions. For example, Why do I believe my sales projections are accurate? How do I know it will take this long to manufacture my product? Why should I believe I can recruit the team in the time allotted? The management discipline that addresses the real challenges any plan or organization faces and deals with threats, active and potential is Risk Management. It is all part of grounding yourself in the realities of the market. You want to understand what you face so that you can adequately plan. I think a lot of people confuse what is Plan B. For many the thinking goes, “If I fail at starting this software company, I can always be a bartender.” If you want to run a nightclub, bartending so you can learn more about running a club might be something of a Plan B. 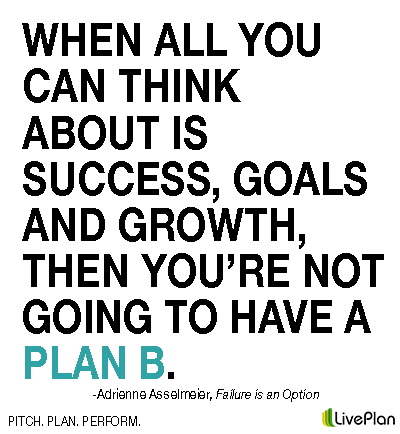 But real Plan B’s are about taking a different approach to getting your dream. I wanted to go to the U.S. Naval Academy for college. I wanted to be a Marine Officer. Knowing that the academic standards were rigorous, my Plan B was not to become a Music major at the local college. I enlisted in the armed forces and got some education to prepare me. This plan also kept me near my dream, keeping me focused on my mission. I entered the Naval Academy 1 year to the day after I entered enlisted service. Sure there was hard work in there, it didn’t happen by magic. But I knew what I wanted and was not going to accept failure. It was an option, but not one I had to settle for.